American Behavioral Health Systems is dedicated to the safety of our clients and staff. We strive to meet and exceed the Federal PREA regulations set forth by the Department of Corrections. Both our clients and staff are continuously educated on all PREA standards and expectations. 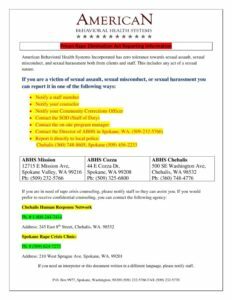 ABHS conducts all Administrative Investigations for potential criminal charges and refers for prosecution individuals determined to have participated in such conduct. All potential criminal investigations are conducted by the geographically appropriate local policing agency. In the event there is an active criminal investigation, ABHS investigators will suspend their investigation to allow local authorities to conduct and complete their investigation. Upon completion of the criminal investigation ABHS will conduct their internal Administrative Investigation.